Tonight’s quads drew a strong bunch of players for both sections. The top quad finished with a three way tie for first between FM Leif Pressman, NM Daniel Lowinger and NM Ian Harris. The second section, a six player swiss, was far more exciting. 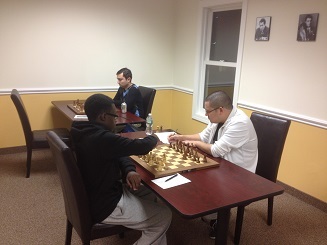 Guy Colas entered the tournament ranked 5/6 and ended up winning the section with 2.5/3. Colas picked up nearly 120 rating points for his effort!